The diameter of a circle is 16 centimeters. What is the area of the circle in centimeters? The area of a circle is found by squaring the circle's radius and multiplying the result by 3.14. The radius is half of the diameter (8 in this case). A circle is inscribed in a square whose side is 6 in. What is the difference in area between the square and the circle, rounded to the nearest square inch? The circle is inscribed in a square when it is drawn within the square so as to touch in as many places as possible. This means that the side of the square is the same as the diameter of the circle. Two equal circles are cut out of a rectangular sheet of paper with the dimensions 10 by 20. The circles were made to have the greatest possible diameter. 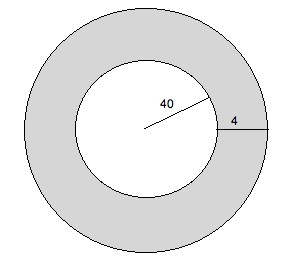 What is the approximate area of the paper after the two circles have been cut out? The length of 20 represents the diameters of both circles. Each circle has a diameter of 10 and since radius is half of the diameter, each circle has a radius of 5. The area of a circle is A = πr2 . The area of one circle is 25π. The area of both circles is 50π. The area of the rectangle is (10)(20) = 200. 200 - 50π gives you the area of the paper after the two circles have been cut out. π is about 3.14, so 200 – 50(3.14) = 43. Kate has a ring-shaped lawn which has an inner radius of 10 feet and an outer radius 25 feet. What is the area of her lawn? where is the radius of the larger circle, and is the radius of the smaller circle. A 6 by 8 rectangle is inscribed in a circle. What is the area of the circle? The image below shows the rectangle inscribed in the circle. Dividing the rectangle into two triangles allows us to find the diameter of the circle, which is equal to the length of the line we drew. Using a2+b2= c2 we get 62 + 82 = c2. c2 = 100, so c = 10. The area of a circle is . Radius is half of the diameter of the circle (which we know is 10), so r = 5. What is the ratio of the area of a circle to the area of the square it circumscribes? Since each angle of a square is a right angle, each intercepts a semicircle; as a result, a diagonal of the square doubles as a diameter of the circle. We will call that common measure , as it will make our ratio easier to calculate. The area of the square is . This formula is important, even though it is not the more commonly known formula of Area = side2. Therefore the ratio of the area of the circle to that of the square is to , which simplifies to to 2. What is the area of a circle with a circumference of 12 inches? The relationship of a circumference of a circle to its radius is . To find the area, use the formula . A park wants to build a circular fountain with a walkway around it. The fountain will have a radius of 40 feet, and the walkway is to be 4 feet wide. If the walkway is to be poured at a depth of 1.5 feet, how many cubic feet of concrete must be mixed to make the walkway? We are searching for the surface area of the shaded region. We can multiply this by the depth (1.5 feet) to find the total volume of this area. The radius of the outer circle is 44 feet. Therefore its area is 442π = 1936π. The area of the inner circle is 402π = 1600π. Therefore the area of the shaded area is 1936π – 1600π = 336π. The volume is 1.5 times this, or 504π. How many times greater is the area of a circle with a radius of 4in., compared to a circle with a radius of 2in.? The area of a circle with radius 4 is while the area of a circle with radius 2 is . What is the area of a circle whose diameter is 8?